260 Commonwealth is located on the south side of Commonwealth, between Fairfield and Gloucester, with 258 Commonwealth to the east and 262 Commonwealth to the west. 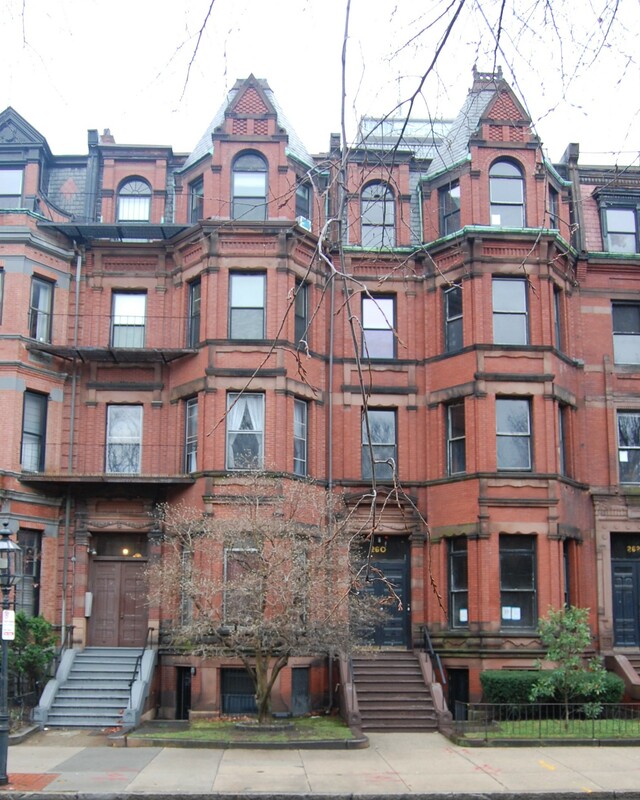 260 Commonwealth was designed by architect Samuel D. Kelley, one of two contiguous houses (258-260 Commonwealth) designed in the same style and built in 1879-1880 by brothers John W. Shapleigh and Samuel M. Shapleigh, carpenters and building contractors, for speculative sale. Samuel D. Kelley subsequently designed three more houses for the Shapleighs at 262-264-266 Commonwealth. Samuel Shapleigh is shown as the owner and builder of 260 Commonwealth on the original building permit application, dated October 10, 1879. Samuel Shapleigh acquired the land for 260 Commonwealth on October 4, 1879, from George H. Braman. The lot was 29 feet wide, and on the same day he purchased a second 19 foot lot to the west, from Charles H. Mann. He used the eastern 24 feet for 260 Commonwealth and sold a one-half interest in the western 24 feet to his brother, John Shapleigh. They then built 262 Commonwealth together on that lot. Both lots had changed hands several times and were part of a parcel previously owned by Nathan Matthews, part of an even larger tract he had purchased on January 2, 1871, from David Sears, Jr., Frederick R. Sears, and Knyvet Sears. Click here for an index to the deeds for 260 Commonwealth. On June 3, 1880, 260 Commonwealth was purchased from Samuel Shapleigh by John O. Poor. He and his wife, Abby C. (Harris) Poor, made it their home. They previously had lived at 678 Tremont. On June 2, 1880, 258 Commonwealth was purchased from John Shapleigh by John Poor’s brother, Charles C. Poor, and he and his wife, Harriet R. (Collins) Poor, made it their home. They previously had lived at 698 Tremont. John and Charles Poor were hide and sole leather dealers in their father’s firm, Henry Poor & Son. Henry Poor had died in January of 1878. In August of 1892, Henry Poor & Son’s largest tannery, in Winn, Maine, was destroyed by fire. As a result of the loss, the firm was unable to meet its obligations and the partners (John Poor, his brother, Charles Poor, and Charles Poor’s two sons, Clarence H. Poor and Robert C. Poor) assigned the company’s and their personal assets to Edward H. Dunn, trustee for the benefit of their creditors. Among the assets they assigned to Edward Dunn were 258 Commonwealth and 260 Commonwealth. On May 26, 1893, both houses were transferred by Edward Dunn to Thomas Emerson Proctor and Nehemiah Webster Rice, both leather manufacturers, and on July 11, 1893, they transferred 258 Commonwealth back to Charles Poor and 260 Commonwealth back to John Poor. John and Abby Poor continued to live at 260 Commonwealth during the 1893-1894 winter season, but moved thereafter to Newton. On May 23, 1894, 260 Commonwealth was purchased from John Poor by Sarah E. (Brigham) Smith, the wife of iron manufacturer Franklin Smith. They previously had lived at 537 Columbus. They continued to live at 260 Commonwealth until his death in October of 1897. The house was not listed in the 1899-1901 Blue Books. On January 2, 1901, 260 Commonwealth was purchased from Sarah Smith by Caroline Melissa (Dodge) Dana, the wife of George Nathaniel Dana. They previously had lived at 321 Commonwealth. George Dana was a merchant and agent for the Eagle Sugar Refinery. George Dana died in February of 1915 and Caroline Dana died in July of 1916. The house was not listed in the 1917-1921 Blue Books. On November 18, 1918, 260 Commonwealth was acquired from Caroline Dana’s estate by Miss Mary Thompson of Hingham. On December 1, 1920, 260 Commonwealth was acquired from Mary Thompson by the Boston Academy of the Sacred Heart, which already owned 262–264–266 Commonwealth, where it maintained a school and convent. 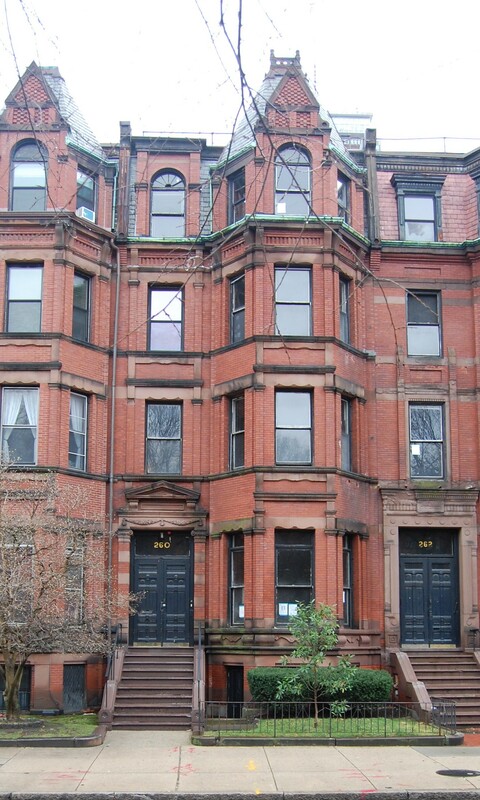 In November of 1920, prior to taking title to the property, it filed for (and subsequently received) permission to cut doors between 260 and 262 Commonwealth to combine 260 Commonwealth with its existing properties, for use as convent dwellings. On December 3, 1925, the Academy of the Sacred Heart sold 260-262-264-266 Commonwealth to Helen M. (Leland) Towle, the widow of real estate dealer Loren Delbert Towle, who had died in September of 1923. In exchange, the Academy acquired the recently completed Towle estate in Newton, where it moved, becoming the Newton Country Day School. By 1928, the lodging house at 260-262-264-266 Commonwealth was operated by Miss Helen M. Catlin and Miss Edith Ray Clapp. They previously had lived at 122 Newbury. The four buildings were operated as one property, with the address of 262 Commonwealth. David Shikes died in August of 1937. His estate and Philip B. Long continued to own the buildings until 1942. On June 2, 1942, Helen Towle foreclosed on the mortgage given by David Shikes and Philip Long when they purchased the property and took possession of 260-262-264-266 Commonwealth. Helen Catlin and Edith Ray Clapp continued to operate the lodging house at 260-262-264-266 Commonwealth until about 1946, and probably until Helen Catlin’s death in February of 1947. Edith Ray Clapp moved thereafter to an apartment at 31 Fairfield. On December 20, 1946, the buildings were acquired from Helen Towle by Morton J. Archer. They continued to be operated as lodging houses. In May of 1947, Morton Archer applied for (and subsequently received) permission to cut openings in the party wall with 262 Commonwealth to provide additional egress. In June of 1949, he applied for permission to install a fire balcony connecting with 258 Commonwealth. In that filing, the name “Goldberg” was crossed-off and replaced by Morton Archer’s name, as treasurer of M & N Hotels, Inc. (at 57 Bernard in Dorchester, Jacob Goldberg’s address). On July 29, 1949, 260-262-264-266 Commonwealth were acquired from Morton Archer by Miss Josephine Mary Ward. 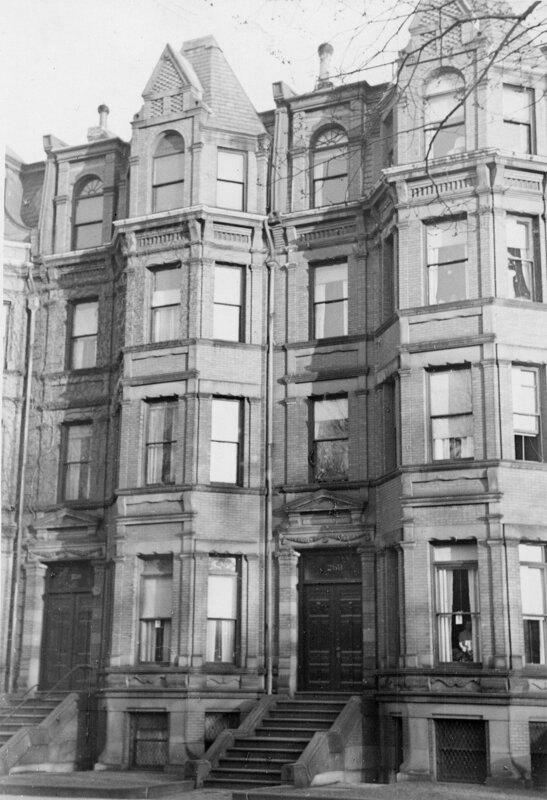 She lived there and continued to operate the four buildings as a lodging house with the address of 262 Commonwealth. She previously had lived in Saugus with her parents, Philip Walter Ward and Ellen M. (Brennan) Ward. Also living at 262 Commonwealth was Miss Helen Bridget Walsh, a former nurse, who may have assisted Josephine Ward in managing the lodging house. In January of 1954, she applied for (and subsequently received) permission to convert 260 Commonwealth from a lodging house into a lodging house and one apartment, and to convert 266 Commonwealth from a lodging house into a lodging house and two apartments. 262-264 Commonwealth remained lodging houses. In March of 1954, she applied for permission to allow automobiles to park for a fee behind 260-262-264-266 Commonwealth. It appears the application was denied. Josephine Ward’s father died in 1954 and in about 1958 her mother, Ellen (Brennan) Ward, joined her at 262 Commonwealth. She previously had lived in an apartment at 470 Beacon and, before that, in Saugus. 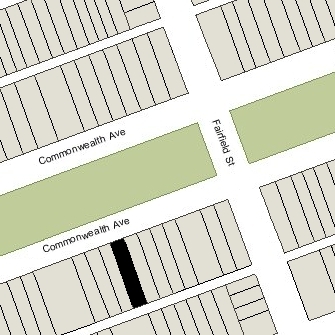 Josephine Ward and her mother continued to live at 262 Commonwealth until about 1960, when they moved to 29 Hereford. Helen Walsh moved with them. On August 25, 1960, 260-262–264–266 Commonwealth were acquired from Josephine Ward by Chamberlayne School and Chamberlayne Junior College, located at 128 Commonwealth. In October of 1960, it applied for (and subsequently received) permission to convert 260 Commonwealth from a lodging house into a dormitory. In May of 1962, Chamberlayne purchased the former Professional Building at 270 Commonwealth and converted it into a dormitory. It purchased 274–276 Commonwealth at the same time, and in June of 1966 it acquired 278–280–282 Commonwealth. On February 1, 1977, 260-262 Commonwealth were purchased from Chamberlayne by George J. Brennan, Jr., Rocco Losano, Louis Francis Musco, Jr., and Frank Carroll (doing business as Commonwealth Management Associates, also known as Garden Halls Dormitories). The Stratford Foundation (successors to Chamberlayne) retained 264-266-270 Commonwealth. On October 22, 1979, Commonwealth Management Associates transferred both properties to George Brennan, Jr., and Louis Musco, Jr. George Brennan and Louis Musco’s father, Louis, Sr., were co-founders of Bay State College, located at 122 Commonwealth, and the buildings were operated as Bay State College dormitories. Louis Musco, Jr., died in May of 1987. 260-262 Commonwealth continued to be owned by George Brennan and Louis Musco’s estate. In December of 2002, George Brennan transferred his interest in the property to the Brennan Family Realty LLC. He died in March of 2014. 260-262 Commonwealth remained a Bay State College dormitory in 2016. On March 7, 2017, 260-262 Commonwealth were acquired from Musco Properties LLC and the Brennan Family Realty Realty LLC by the Commonwealth Avenue Partners LLC (Marcel Safar and Xavier Giraud, managers of record).